In general, dewatering means modification of ground by redirecting seepages, lowering the ground water table or in simple sense reduction of water content in foundation soil. Two types of dewatering techniques available; one is by gravity without application of external forces, another is forced consolidation. • To keep working place dry like excavation for dams, building foundations and tunnels. Any engineer who deals with soil should have good knowledge about soil-water relationship. The perspective of engineers may be quite different depending on their special backgrounds. Who deals with ground water hydrology, would emphasize water flow characteristics in respect to directions and quantity. A geotechnical engineer should be aware of benefits derived from reduction of pore water pressure and respective increase in strength; here consequent improve in slope stability and increase in bearing capacity are more important. An engineer who deals with road construction should have interest on assessing equilibrium moisture condition within subgrade. A pavement designer would be more concern about water transmission in the form of vapor rather than liquid form. Now let’s concentrate about techniques of dewatering of soil. The techniques required for coarse-grained are not same that for fine grained soil. Coarse grained soils can be dewatered by the action of gravity which allows drainage into ditches, slump and wells. In this case pumping is required to discharge accumulated water. Gravity drainage is not suitable for fine grained soils, as drainage is ineffective or very slow. This type of soil dewatering process means forced consolidation; it includes preloading or electro-osmosis. 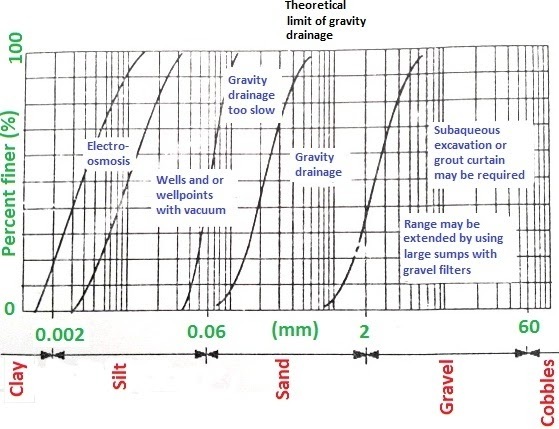 Selection of traditional dewatering techniques as ground water control depends on grain size distribution of respective soil largely which are illustrated in following figure. Installation of wells and drainage system are very old building problem; but drilling and as well pumping technology are still improving steadily. Now-a-days inclusion of geotextile and geomembranes make construction procedures highly efficient. Hydraulics of well and slots should be basis of designing dewatering systems for slopes and excavation. Drainage, seepage and filtration of geosynthetics should be considered in design of dewatering system considering its application in preloading system of vertical drains for consolidating fine grained soils. Electro-osmosis technique is based on the principle of water flow through soils due to passing DC electricity through it. The water flows toward cathode, the negative terminal, following direction of the conventional current. This characteristics of water in soil under passing of electricity was recognized many years ago; but has found relatively few applications. It performs well in improving foundation performance and modifying difficult soil. Electro-osmosis is considered equivalent to traditional consolidation. Thus theory implied to analyze densification of fine-grained soils under dewatering due to application of surcharge can be used to predict influence of electro-osmosis. These techniques or method cannot perform alone and required dewatering simultaneously. The conventional dewatering methods include mainly gravity flow methods which include open ditches and slumps, gravity flow well including bored wells, well point system etc. and vacuum dewatering wells. The most cheapest and common dewatering method is open ditches and sumps where water is collected on sumps or ditches and removing by pumping or if possible by gravity flow. • Bottom instability under the influence of upward seepage gradient which is known as ‘quick’ condition. When clayey slopes have to stabilized by dewatering, toe drain with lateral slots filled with gravel (Figure 01) can be used. Together with gradual dewatering, supporting effect of buried gravel filled wall provides a good stabilization option. 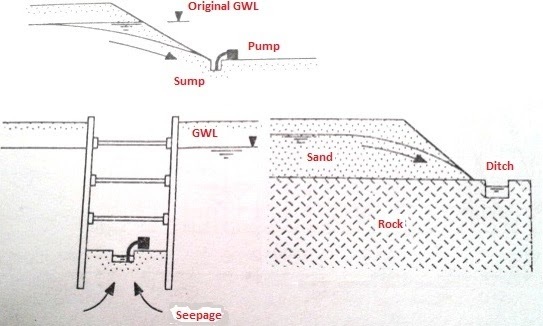 This are identical method of stabilizing soil as that of gravel columns or sand piles in foundations; figure 02 shows different application of sump or ditches. When water is removed from a borehole by a steady pumping action, the water level is lowered in borehole which influences ground water to flow into well until phreatic surface has been dropped to an equilibrium position; flow of water to well is under gravity. Phreatic surface is the level where water pressure is equivalent to one atmospheric pressure. Gravity flow wells can be installed in construction site to low water table, the aim of lowering phreatic line is different for different type of soil. The usual target of dewatering for coarse sand or gravel are to lower phreatic line to 0.5 m or more blow base of expected excavation. This lowering of level is not considered enough for fine grained soil, it is perfect to lower this line more than 0.7 meter below base of desired excavation level. In standard bore wells there has an inner casing which installed into cased borehole. At the bottom of inner casing there have a screen section. Filter materials (well graded as per design) are dropped into remaining space between outer and inner casing. Outer casing is taken out while dropping filter materials. Filter materials should fulfill the both criteria of permeability and retention. A riser pipe is lower into inner casing, which helps to reach pumping water to surface. The casing with well screen may reach upto 10~20 m from surface; in general, the diameter lies in between (150~200)mm. In on-stage pumping installations, water level can be lower at best (3.5~4) meter near center of excavation for building construction. When expectation is more, multi-stage installing, though more complicated, are often used. Venturi principle is used to reach deeper than by standard arrangement. As per experience from many deep and large diameter wells working in industrial and municipal water supply, we can conclude that modern submersible pumps virtually have no limit in respect of both diameter and depth of wells, we considered in practice application. In well-point system, wells are spaced closely; all are single pipe wells with common header pipe which is connected to central pumping installation. The individual wells are usually of small diameter. Many patented system for well-point installation are available as shown in Fig. Well points are jetted or driven into construction site. As standard bored wells, after driving the system of well point to expected depth, filter materials are dropped down into hole to form a sand filter. As filler materials as coarse sand is feed. This process is known as ‘sanding in’. A vacuum is generated in header main, which discharge water from well, accumulated under the action of gravity. Thus, the common header allows total system to be activated at a time. The flow of water toward wells under gravity is available in relatively permeable soils. In case of fine sands, the permeability drop down to (10-4 ~10-6)which means capillary tension is enough to counteract gravity. Thus, water will not flow freely to wells. In this type of soil vacuum dewatering wells are required. To facilitate dewatering or at least to start to flow water to wells, a vacuum is created to well. The vacuum is applied at filter section of well which is sealed off to keep vacuum condition. Now atmospheric pressure forces water to flow toward well increasing seepage. The inflow of water is generally very low and intermittent pumping of well is required to discharge accumulated water.In well-point system may also have action of vacuum. The net vacuum used at well point is calculated by subtracting lift in riser pipe from vacuum generated in header pipe. Extreme care is required to keep all connection of the system of pipes airtight. It is required to form effective seal around riser pipe at upper section of it. Vacuum wells are spaced, usually very closely like spacing is (1~2.5) m. Row spacing of vacuum wells should be at best (15~20) m.This is done to become well effective as water accumulation rate is very low. To achieve greater depth of dewatering, submersible pumps together with vacuum pumps are used.